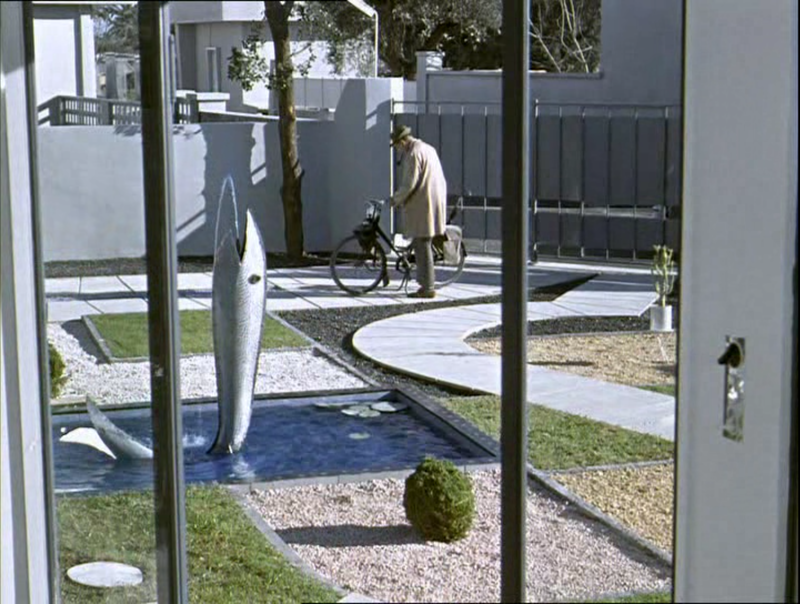 The comedy of Jacques Tati and of his character Monsieur Hulot is so laden with humor that laughter is often rendered difficult to muster. This seems contradictory: isn’t there a one to one correspondence between funny things and laughter? Common sense would suggest that the answer is yes, and yet the screening of Tati’s Playtime early in the quarter proved this to be not necessarily true. Tati stuffs a remarkable amount of humorous material into each shot of the film, but not all of it provokes immediate laughter. 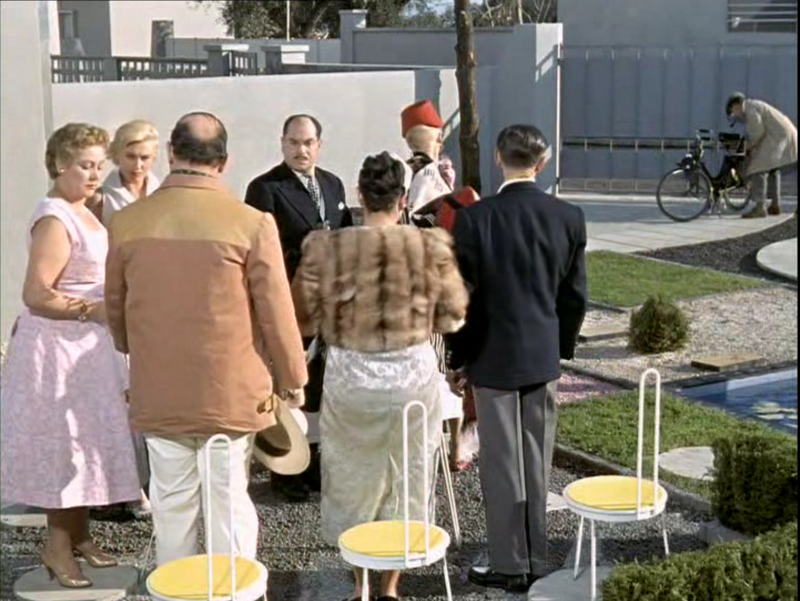 The goal of this blog post is a close examination of another Tati film, Mon Oncle, with an eye towards his construction of comedic moments. This post will take Monsieur Hulot as its central figure in an examination of his interactions with the spaces through which he travels. 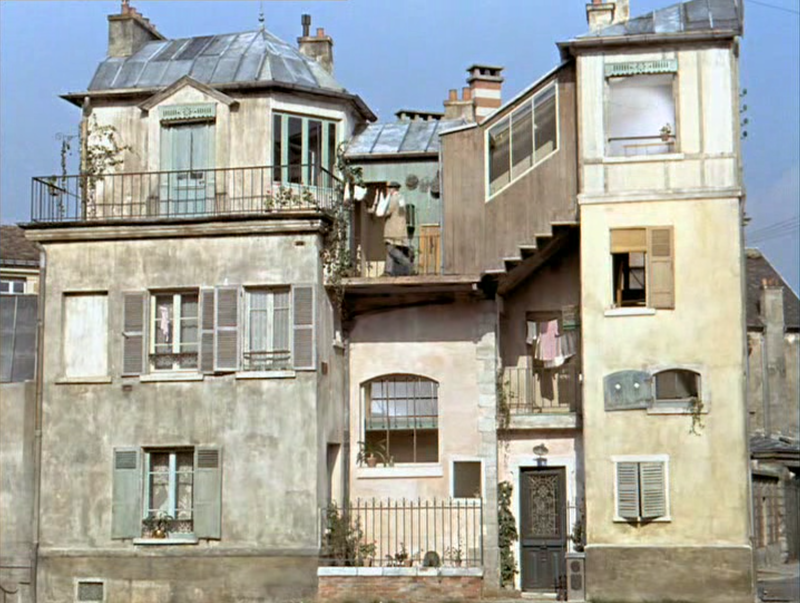 Monsieur Hulot’s home in the old city is characterized by an improvisational nature; the style of comedy associated with this location follows suit. 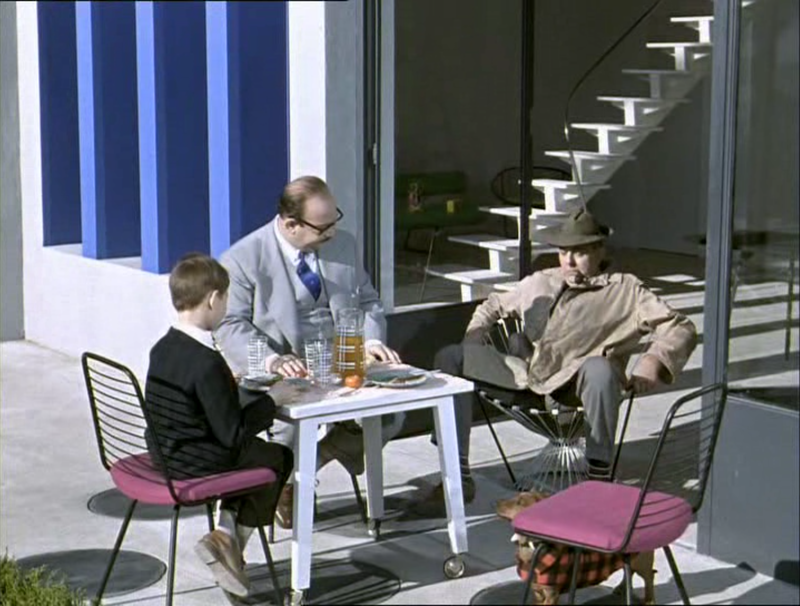 This improvisational nature is evident from Tati’s introductory long shots of the building, even before Hulot has appeared and begun to interact with it. The building resembles a dollhouse that has been constructed out of a patchwork of several preexisting structures, or a home that has been renovated in stages over a prolonged period of time. Windows and chimneys are positioned in strange patterns and at bizarre angles. 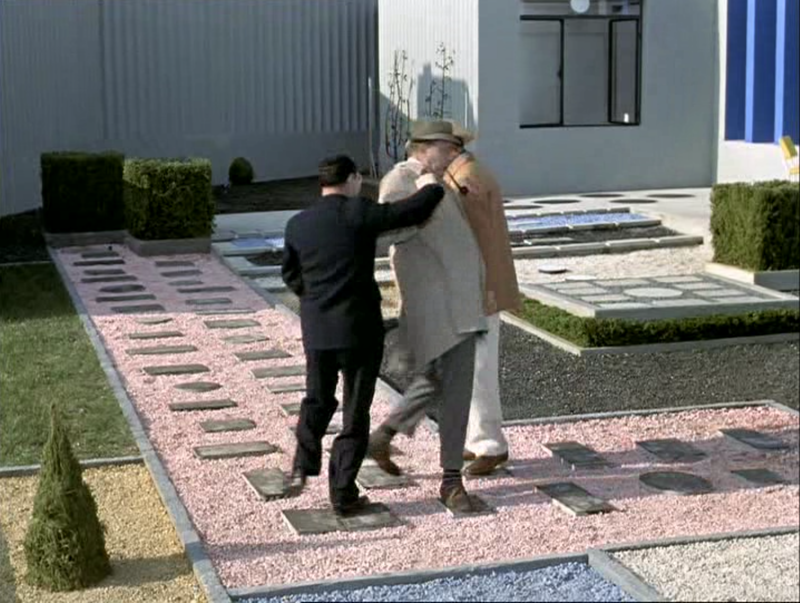 The building’s exterior architecture is as unpredictable as are Hulot’s movements and mannerisms. When he appears onscreen and begins to walk through and interact with the building, it becomes immediately clear that the two are meant for each other. 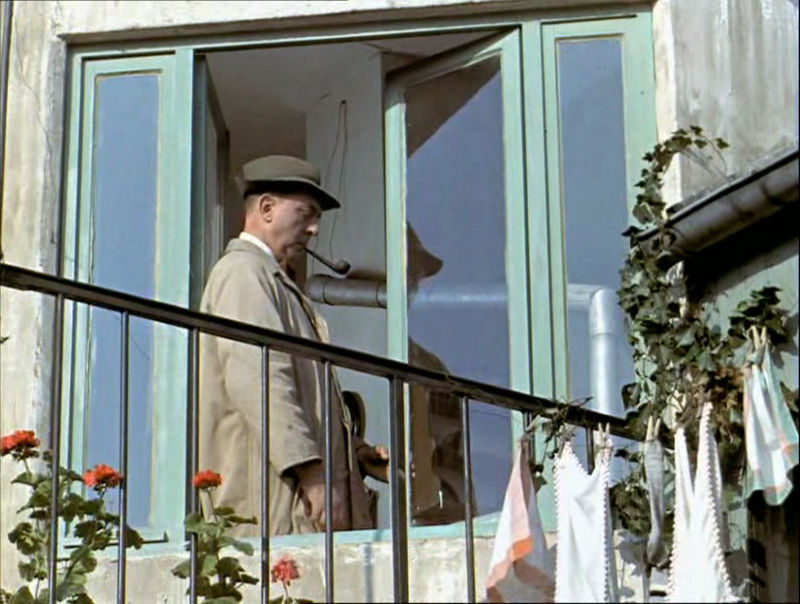 Tati allows his camera to remain fixed on a long shot of Hulot exploring the various facets of the building’s exterior for quite an extended period of time; this leisurely pace allows the viewer to witness and understand Hulot’s style of comedy in his most familiar space. It allows us to see Hulot in his comfort zone, to heighten the ensuing comedy of seeing him try to operate in a space that is the antithesis of his natural habitat. Here he plays with windows, house pets, and his neighbors in an innocent, exploratory manner. The limits of this building, however, are evident in the very improvisational qualities that characterize it. 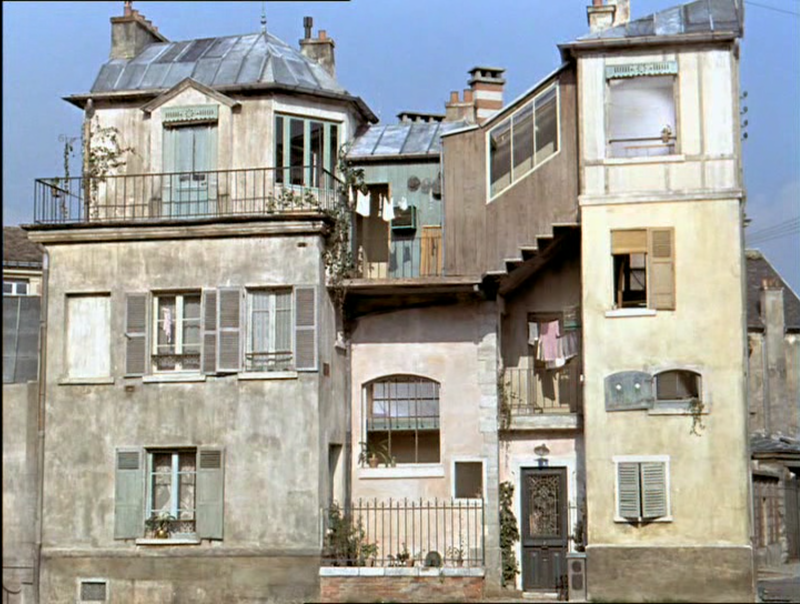 One gets the sense that the interior of the house is never clearly shown because it is not necessarily a static space; rather it adapts itself to whatever Hulot requires of it. This is well and good, but it makes the building seem more like the two dimensional representation of a space than a fully fleshed out location. As such the building has many humorous features, it contains many elements of what could become jokes, but in the end it is a limited comedic space. 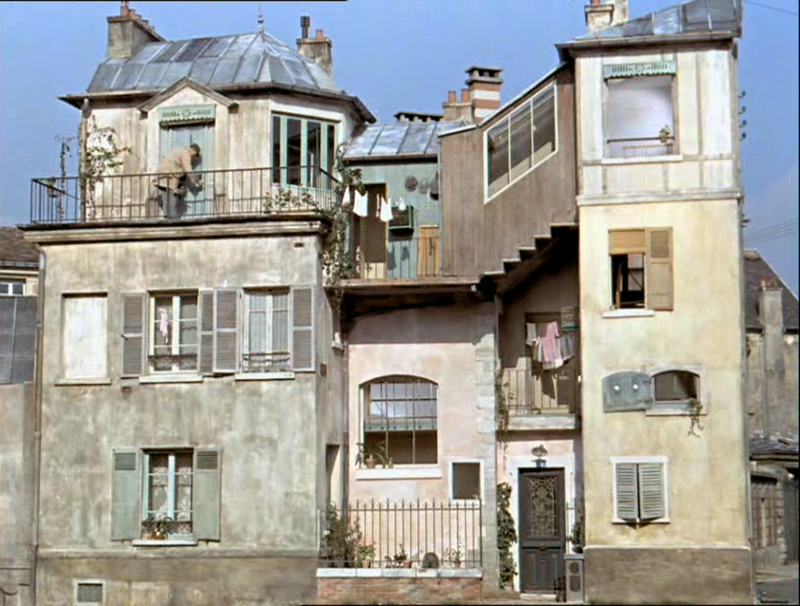 In sharp contrast to the improvisational tone of Hulot’s home in the old city, the home of his relatives in the new city is intensely scripted. In the same prolonged long shot style, Tati lingers on the exterior of the home while life happens within and around it as an introduction to this world. 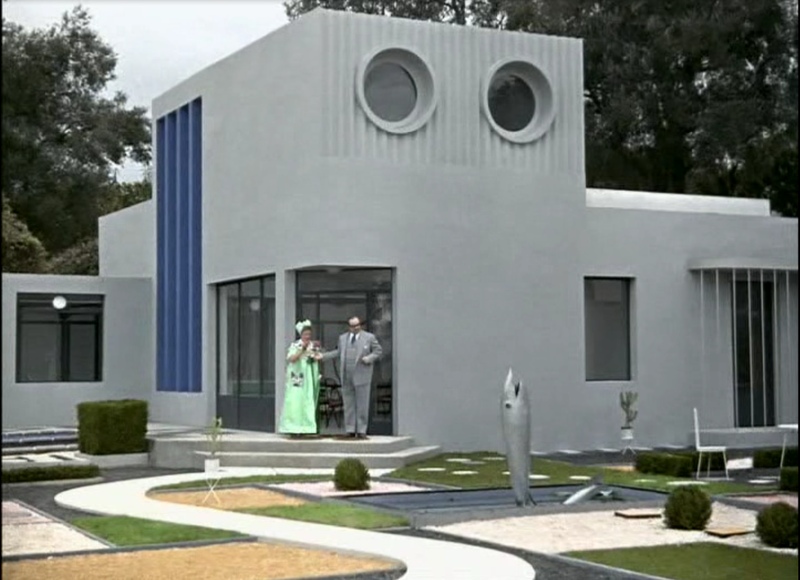 Instead of Hulot bumbling around a whimsical French apartment building, we are given Monsieur and Madame Arpel emerging from their home, which looks like either a small factory or a large robot. Its upper windows look like eyes and the main entrance is an off center mouth. The senselessly curved walkway and semi-operational fountain fish point to this house as a zone of arbitrary rules. 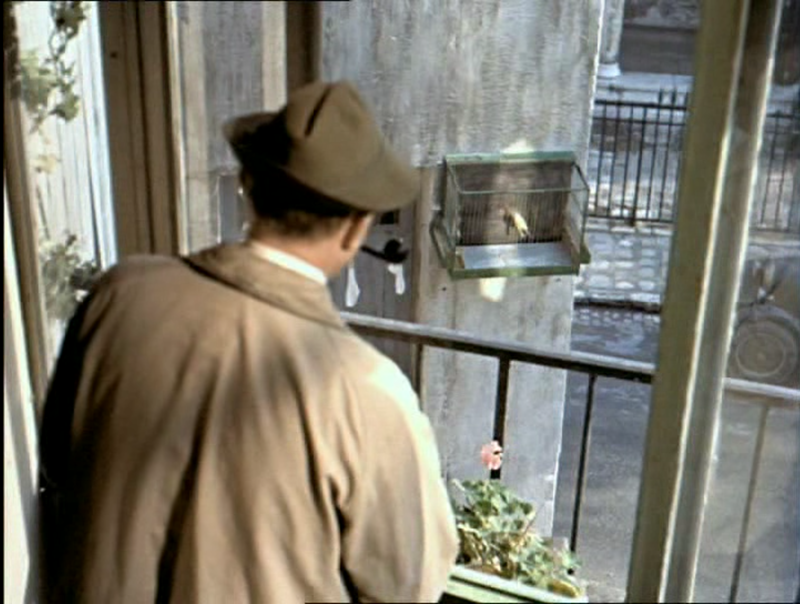 Its arbitrary nature is not fully exposed, however, until Hulot arrives on the scene. It is evident that Hulot is a foreigner in this modern zone from the moment he passes through the Arpel’s gate on his bicycle. The sight of him respectfully parking his bike as one would a car, with pipe in mouth, registers as pitifully antiquated. As he proceeds to move about the house, it is clear that his exploratory nature is ill suited to the rigidity of modern life. His first visit to the Arpel home is all about exposing his unsuitability. He does not know how to behave at the table and runs amok in the kitchen. This scene, as is the case with Hulot at home, is still more concerned with establishing comedic possibility than with its execution. The comedic possibilities introduced here are realized more fully in his next prolonged visit with the Arpels, when he plays the role of their party guest. 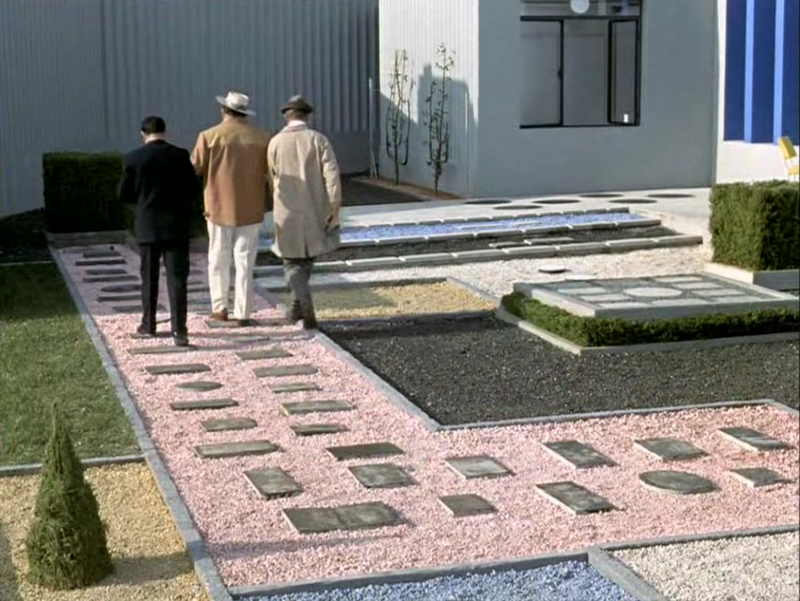 The principle on which this scene’s comedy rests, and the beauty of Hulot in general, is that as he moves from a zone of improvisation to a zone of rules, instead of conforming he superimposes his improvisational lifestyle onto the norms of a rule-based society. So he arrives at the party on his bicycle, because his bicycle is his means of transportation, and this time it registers as hilarious because of the appalled manner in which the Arpels and their guests all react to this entrance. 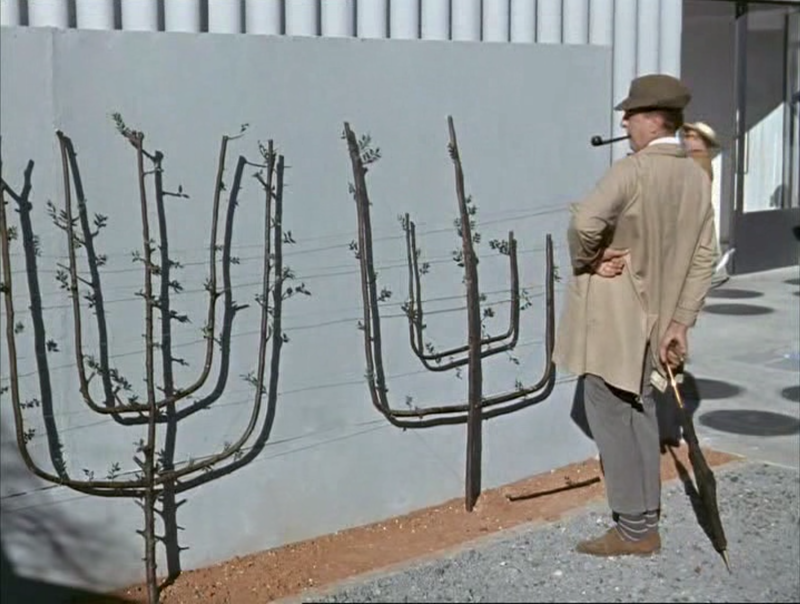 When young Gerard breaks his parents’ decorative vine – which looks as unnatural as the house itself – Hulot attempts to cover his nephew’s tracks by making what he believes to be complimentary alterations. This act of improvisation is classic Hulot in its combination of good intentions and mildly disastrous results. And when he learns that the rules of walking on the gravel pathway involve moving at an inconveniently slow pace, he attempts to create his own set of rules to great comedic effect. He sees the rules by which the people around him are living and, instead of conforming, attempts to remain true to his impulses amid the rigid structure. Hulot does not emerge from the film as a bumbling idiot. He emerges as an individualist, as a person who would always prefer to discover his own way, even when this way is fraught with inconveniences, than blindly conform to the status quo of the moment. It is this impulse for originality amid a society striving for the automatic, for the thoughtless, from which Hulot’s comedy emerges.